Chicago White Sox left-hander Chris Sale was activated off the disabled list and will start Thursday night against the New York Yankees. The Chicago White Sox will need a new closer now that Matt Lindstrom is on the disabled list, so in the spirit of horse racing's Triple Crown season, we will break down the contenders to win this particular race. NEW YORKFIRST PITCH: The Mets have lost a season-high five straight as well as eight of nine. They also now occupy sole possession of last place in the National League East. 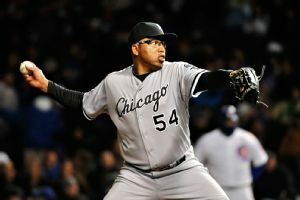 CHICAGO  The Chicago White Sox purchased the contract of veteran reliever Frank Francisco from Triple-A Charlotte and designated right-hander Maikel Cleto for assignment. PHOENIXFIRST PITCH: For the sixth time this young season, the Mets (6-7) will attempt to move back to .500 on Tuesday night.Each other time -- with their record at 0-1, 2-3, 3-4, 4-5 and 5-6 -- they have lost. Looking for bullpen help, the Chicago White Sox signed free agent right-hander Frank Francisco on Monday and sent the 34-year old to Triple-A Charlotte. Jordany Valdespin reportedly has abandoned his Dominican winter-league team during the playoffs after getting upset at getting pinch-hit for during a playoff game by Ronny Paulino. 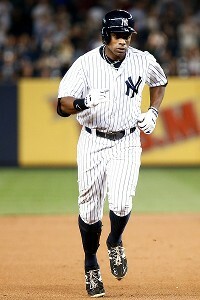 New York Mets and outfielder Curtis Granderson have agreed on a four-year, $60 million deal, pending the outcome of a physical, ESPN sources say. Talks between the New York Mets and Curtis Grandersons representatives intensified Tuesday, and a source said the organization is negotiating to land the free-agent outfielder on a three-year deal. Seven Mets became free agents as of 9 a.m. Thursday: David Aardsma, Tim Byrdak, Pedro Feliciano, Frank Francisco, Aaron Harang, LaTroy Hawkins and Daisuke Matsuzaka.